There are at least 325 incident reports involving Gree manufacturer dehumidifiers overheating and even catching fire. Many branded Dehumidifiers including Danby, De’Longhi, Fedders, Fellini, Frigidaire, Gree, Kenmore, Norpole, Premiere, Seabreeze, SoleusAir and SuperClima have been recalled by the manufacturer Gree Electric Appliances of China due to reports of overheating. 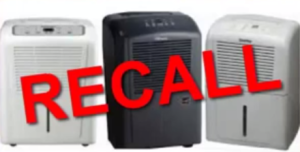 There are hundreds of reports filed with the Consumer Products Safety Commission (cpsc.gov) of overheating, and at least 71 reports of fires causing almost $3,000,000 in property damage. Gree Dehumidifiers are sold at Sam’s Club, Home Depot, Kmart, Lowe’s, and more in the USA and Canada; as well as online at Amazon and Ebay. Many people use dehumidifiers in the basements to help reduce moisture and mold. 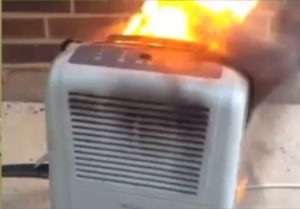 But this is a problem because if you leave the dehumidifier on and running all the time, it may overheat and catch fire. It could burn down your house or business. If one of these overheated at night in your home while you were sleeping it could put everyone in danger. The smoke damage alone could also cause thousands of dollars in property damage. Unplug these units immediately. Contact Gree to apply for a refund. If you have been injured or your property damaged, please give us a call. We may be able to help. About 2.2 million of these units were sold in the US and Canada. Additional information can be obtained from the CPSC.gov website. There are too many Model numbers to list here, so see the Consumer Product Safety Commission website for a complete list.